Double lock standing seam roofing is used on a wide range of building types from leisure and commercial to housing and religious buildings. Here our colleagues at elZinc® provide an introduction and look at the design considerations for standing seam zinc roofing. In the next post we’ll look at some typical build-ups. Standing seam roofing is the most popular way of covering a roof in zinc and has been used for over a century. The fine lines of the standing seams give the system its light, attractive appearance and contribute to its flexibility. Modern profiling and seaming technology makes quick work of large roofs, decreasing installation times and associated direct and indirect costs. Before long strip standing seam was available panels were made up in short sheets (1800-2000mm) and jointed, which was time consuming. Modern profiling means you can cover up to 13 metres in a single strip. As a result, standing seam roofing is probably the most cost effective way of installing a zinc roof. The roofing can be installed over a ventilated or non-ventilated roof construction allowing you to choose the best solution for the characteristics of your project. Fixings are hidden and indirect. The standing seam roofing needs a continuous support behind it and normally uses an elZinc® sheet thicknesses of between 0.65 and 0.8mm. The covering is then able to withstand a certain amount of foot traffic. The standing seam should always follow the line of maximum pitch if possible. The seams themselves are fairly fine, but in sunny weather the shadows they cast are clearly visible on the surface of the roof. A unique characteristic of light gauge metal roofs is the subtle quilting that can appear naturally under different light conditions, bringing a bit of visual ‘vibration’ and ‘energy’ to the building. Many architects appreciate this, but your client might be less keen. 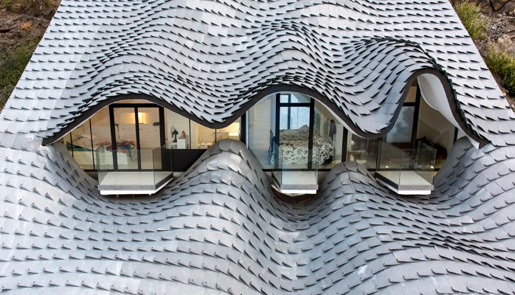 Quilting is more noticeable on steeply pitches roofs and façades but if you’d like to reduce quilting to a minimum elZinc® zinc roofing material helps here by having excellent flatness and low residual tension leading to very flat trays. Limit the width of the trays to 430mm. The longitudinal joint is a 25mm high double lock standing seam. The double lock welt of the seam is raised above the water drainage part of the tray. The standing seam is formed by profiling or folding elZinc® strips and sheets into trays. An undercloak is formed along one edge (this is the edge that is fixed with clips) and an overcloak along the other. To make the joint, the overcloak is welted around the undercloak of the adjoining tray, covering the clips. The two trays are then seamed up using seaming irons or seaming machines. 70mm of material is used to form the seam. The angle standing seam joint is limited to use on slopes pitched at least 25° or above. The double lock standing seam is considered weather-tight above 7° without sealing, and at or above 3° when it is sealed. This is normally accomplished using closed cell self- expanding sealing strips. It is sometimes necessary to join standing seam trays end to end. Without going into too much detail, this may be to introduce an expansion joint on ‘long’ roofs (long eaves to ridge measurement), as part of the flashing work around a chimney or skylight, or to produce a change in tray width on a conical roof. Generally speaking the type of joint used will depend on the pitch of the roof slope, as shown in these diagrams. Save for the step joint, none of the joints require any changes in the substrate design or lateral verge/side abutment detailing. The stepped joint however requires a 60mm high jump to be created in the substrate, either by lifting the entire upper part of the roof or by creating a fillet in the top surface. Either way, the profile of the step can be hidden by creating a small parapet (h = 100mm) along the lateral edges of the roof to hide the step within the external verge profile. 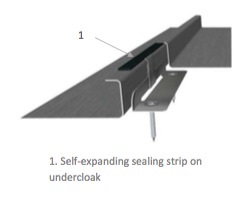 The hidden fixing of standing seam zinc roofing is indirect using clips that are hooked into the seam and normally screwed or nailed to the substrate below. If the length of the elZinc® trays is under 1.5m, fixed clips can be used throughout. Trays over 1.5m require a combination of fixed clips and sliding clips to allow for thermal movement of the trays, and provision for movement at eaves and ridge. These clips should be sufficient in number to resist the design wind loading for each project. Normally 6 clips per m2 prove to be enough for buildings not taller than 8m, whereas corners and edges of taller buildings will need more – please contact us for additional detailed information. The distribution of the fixed clips depends on roof pitch – the steeper the pitch, the higher the band of fixed clips is positioned. This means that the lower the pitch of the roof, both the longer the trays can be before an expansion joint must be introduced or before special measures need to be taken, for example the use of special sliding clips. Since the trays are only fixed along their seams, the distance between trays is determined according to expected wind loading, and tied in to commercially available coil widths. The location, exposure, orientation and roof geometry all influence wind uplift and advice should be sought when deciding on seam centres. This is not just to ensure that the roof does not suffer during storms, it is also to avoid fluttering of the trays during constantly windy conditions. These widths are used in combination with varying thicknesses from 0.65mm to 0.8mm to ensure the roof meets all performance criteria to which it is designed. The maximum lengths of the trays is a nominal 10m, but this can be increased slightly on flatter roofs or by using special clips which allow for more movement, up to a maximum of 15m. Rainwater is either drained by way of internal or parapet gutters or externally mounted eaves gutters. Both types are normally executed in zinc. They can be laid horizontally but a fall of 1 in 200 is recommended as this promotes some self-cleaning and quickens drainage. The gutters are installed to allow for thermal movement, both between themselves and the roof covering and within the length of each gutter run, the latter being resolved by introducing expansion joints. Gutters should be protected from snow slipping into them from the roofing sheets by fitting snow guards, and heated wires are advised in cold climates where ice build-up can occur. Standing seam zinc roofing systems are installed from left to right or right to left across the roof, or outwards from a centrally placed undercloak – undercloak tray that ensures trays of equal width (and therefore symmetry) at both sides of the roof. Detailed installation guidance is given in the publication ‘elZinc® – Details, Processing and Installation’. Contact us for a copy using the link below. A FTMRC registered reputable specialist hard metal roofing contractor should carry out the Installation. SIG Zinc and Copper can offer contact information on suitable contractors. In Part 2 of this series we look at typical roof build ups for standing seam zinc roofing. Part 3 is on barrel vaults and domes in zinc. Please subscribe here to make sure you don’t miss our future posts on metal roofing and cladding, flat and green roofs.